Either someone is trolling ESPN's Scott Van Pelt to an epic level, or the potential unreliability of Wikipedia that our teacher's warned us about in school is real. 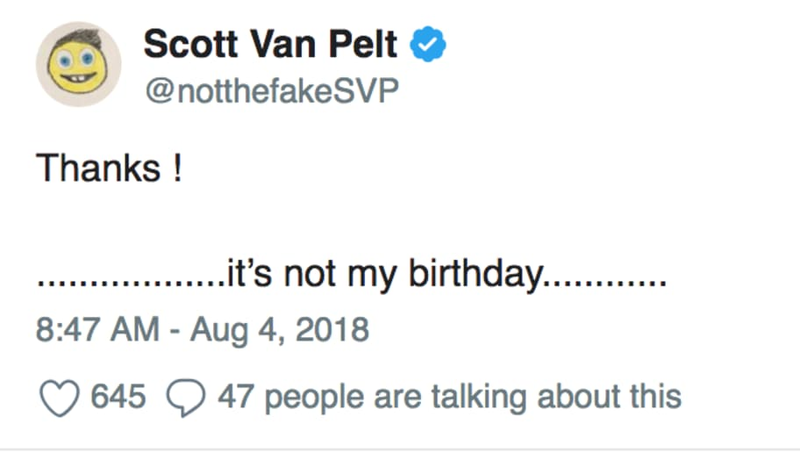 Either way, the Twitter community has been mistaken in thinking the popular broadcaster's birthday is August 4 (thanks to Wiki), which has led to hilarious confusion and SVP getting his mentions blown up in the process. Well, that should set the record straight, right? I’m aware. That doesn’t make it my birthday. No way Wikipedia could get it wrong. Not when it has helped get 99.9 percent of college students through college. Leaving I️t on there? I haven’t PUT anything on there in the first place. Someone HAD to put in on there. Friend? Colleague? Or just a mistaken fan who could have sworn they got the date right? Looks like Van Pelt got to the point where all he could do was just respond to no avail. Even ESPN's SportsCenter got it wrong. Or maybe they are just trying to cover up where the prank originated from in the first place. Happy Halloween, Merry Christmas and Happy New Year to you, PFT. 3 things which, like my birthday, aren’t today. Barstool Sports' PFT Commenter also could be a suspect in starting this hilarious mixup. If so, bravo on his part. I give up. I hope everyone has a great day. And birthday. Whenever it is. ​Good idea, SVP. The way it was going, you would have been there all day trying to convince everyone otherwise. Maybe this is his freaking birthday and he's just thorny?